Placing little emphasis on ornate designs and focusing on the overall utility and hardiness of the piece, the Shakers spent decades perfecting their way of furniture craftsmanship that is still emulated today. As a stunning example of this practice, our American Heritage Shaker Collection offers a glimpse into the past, with customizable pieces to fit any bedroom suite. As a quaint addition to your storage decor, our handcrafted Shaker Lingerie Chest provides plenty of additional space to keep your bedroom necessities, while occupying a very small portion of your overall space. The classic design offers large, flat panel sides that beautifully display the grain of the hardwood that you choose. Above, a solid top is available to keep your must-haves close at hand, while the six flat-front drawers below each offer plenty of additional storage for clothes, delicate items, or anything else you may need when it comes to getting ready for the day ahead. As a standard feature, each drawer box is mounted to the frame with full-extension drawer slides that allow complete access to any item that you have stored inside. Once you've found what you're looking for, a simple push to close this drawer will reveal the soft-close mechanism inside, guiding the drawer to a complete and silent close every time. 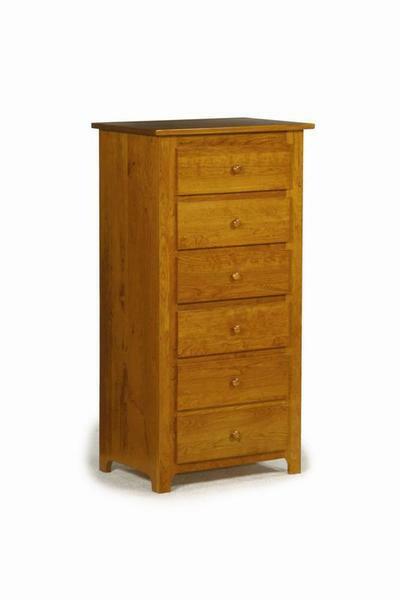 Customize this chest to fit any bedroom in the home - with an array of hardwood and finish options to choose from. And, while this chest will fit most spaces, we understand that you may need something different. Please call one of our experienced Furniture Specialists today for a free custom quote to tailor the dimensions or details of this lingerie chest to fit your home.